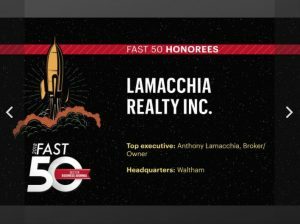 March 28, 2018 – The Boston Business Journal announced their list of the 50 fastest-growing private companies in Massachusetts which included Lamacchia Realty. Honorees of the Fast 50 were selected based on their financial performance; firms included in this list reported revenue of at least $500,000 in 2014 and at least $1 million in 2017. 130 privately held companies applied for consideration on the 2018 Fast 50. Rankings will be revealed in May of 2018. 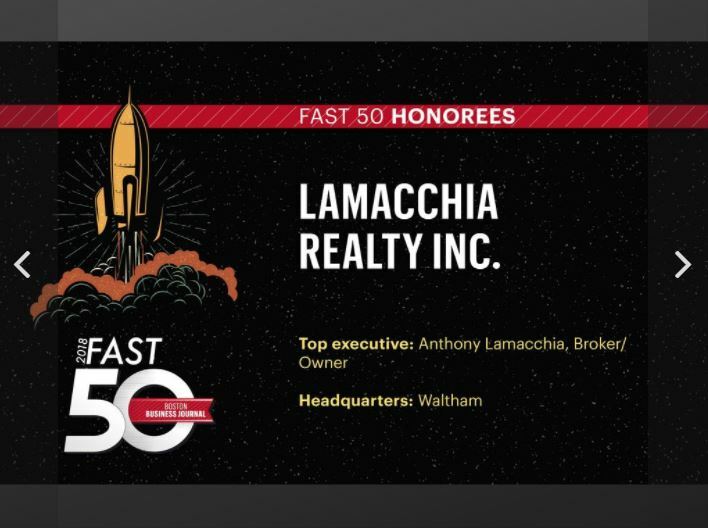 In 2017, Lamacchia Realty also made Inc.’s 2017 List of 5,000 Fastest Growing Companies in America for the 6th time in a row, was named Honoree in the 2017 Inc. Magazine’s Best Workplaces Contest, and received the Leading Real Estate Companies of the World Fast Tracker Award. In the last three years, Lamacchia Realty has more than doubled in agent count, sales volume and revenue. Lamacchia Realty opened two offices in Woburn and Worcester in 2016, in addition to the existing Waltham and Westford offices. In 2017, their fifth office in Norwood was opened as well. On average, agents who join Lamacchia more than triple their business in their first twelve months. Lamacchia Realty agents demonstrate the highest level of integrity, determination, and provide exceptional service while implementing the innovative strategies they learn from the company’s REAL training program. Lamacchia Realty’s mission is to provide industry-leading training, support, systems, and technology to its agents and employees so they can reach their fullest potential. To learn more about what the Realtors at Lamacchia think of the company watch this video from our “Get More with Lamacchia” video series by clicking here.